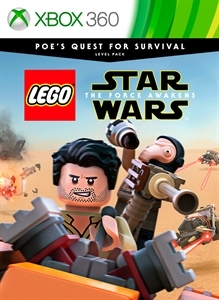 The Poe’s Quest for Survival Level Pack extends the LEGO Star Wars: The Force Awakens experience with a whole new adventure not seen in the film. After a daring escape from the First Order that left him stranded on Jakku, Poe Dameron must search for BB-8 and locate a ship to escape the desert planet. Can he evade the dangers of Jakku and find a way back to the Resistance?